The Omni Group has been testing its new OmniFocus Mail Drop, a service which lets you forward emails to a secret address, whereupon they end up — moments later — in your OmniFocus inbox. This means that we can finally (finally!) add emails direct to our Omnifocus from our iPhones and iPads. But with a little jiggery-pokery, you can finagle some automated internet services to do much more. In this post I’ll show you how I now collect news items from Google Reader and have them waiting for me in Omnifocus and Writing Kit, ready to be written up. 1 Check email, and forward potential stories to myself using a special address that lets my Mac process them and add them to OmniFocus. Cross fingers and hope that the mail rules actually work (success rate: less than 20%). 2 Check my RSS feeds using Mr. Reader on the iPad. Add any potential stories direct to Omnifocus thanks to Mr. Reader’s almost limitless sharing abilities. 3 Start writing. Grab a URL from OmniFocus, launch Writing Kit (my favorite research/writing app) and paste the URL into its browser. As you can see, the new Mail Drop easily simplifies stage 1, letting me forward any mails direct to OF. In theory, it should also send pictures, but I haven’t tested that yet. But using the magic of Google Reader Tags (Mr. Reader is a Google Reader Client), I can now automate the adding of feed items to OF, and also send the source article straight to Writing Kit’s research center. How? IFTTT, or If This Then That, the amazing web automation service. These tricks are crafted to work with my own set of apps, but you can tweak them as you like. First is the OmniFocus part. 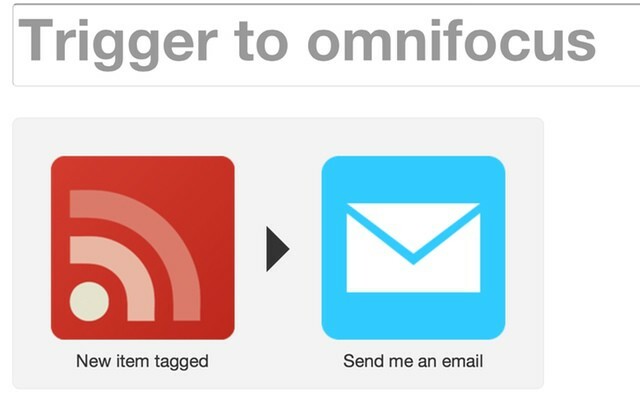 Using IFTTT, I set a trigger to look for any item in my Google Reader with a specific tag. In a fit of creativity, I chose “Trigger” as the tag name. Whenever IFTTT sees a newly tagged article, it sends that article to an e-mail address. And guess which address it uses? Thus, tagging an item adds it to my OmniFocus inbox with one click. I set up a second rule in IFTTT with the same trigger (the “Trigger” tag in Google Reader). This time, though, the “that” part of If This Then That adds the item to Readability. And that’s it. To sum up: I tag an article in Mr. Reader (or any other Google Reader client) and that article is them sent to OmniFocus as a to-do item, with the source article saved in my Readability queue, ready to be accessed as research in Writing Kit. It works seamlessly, and as IFTTT seems to learn which of your rules receive the most traffic, and adjusts its polling period accordingly, once you get up and running things happen almost instantly. I like to make a second pot of coffee after I have harvested the days news, ready to get started writing, and this gives everything time to sync up. As you can see, this is a pretty specific workflow, but as you can also see, it’s a great example of how we can use web services to further obviate the need for a computer. And I’m all for that. Who needs a stupid laptop anymore anyway?